A three-year-old Asiatic Black bear named Champa has just undergone successful surgery to remove a buildup of water in her brain. 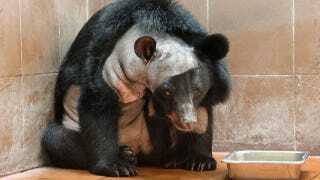 It marks the first time in medical history that a bear has been given such a procedure. Champa has lived most of her life at a northern Laos sanctuary run by Free the Bears, an Australian conservation group that protects bears from wildlife traffickers. Asiatic Black bears are hunted for their bile — a valuable ingredient in traditional Chinese and Korean medicine. She was rescued when still a cub, but Champa’s handlers soon noticed she had a protruding forehead and had difficulty socializing with other bears. Eventually, the growth slowed, but her behavior became increasingly erratic and her vision faded. Veterinarians diagnosed her as having hydrocephalus — water on the brain. Because it’s against Buddhist tradition to euthanize animals, the sanctuary staff arranged for a specialist, Romain Pizzi, to perform a technique called “keyhole” or laparoscopic surgery in which a small incision is made with the help of a small camera. And indeed, Champa was in good hands; Pizzi has performed similar surgeries on other nonhuman animals, including seals, reindeer, and jaguars. In preparation, Pizzi talked to pediatric surgeons, studied bear skulls and brains, and looked at the brains of a hydrocephalic otter and fox. The procedure lasted six hours (details here). At one point a medical pump short-circuited on account of the high humidity, and Pizzi had to resort to a mattress pump to keep the bear’s abdomen inflated. Soon after the surgery, Champa could finally raise her head to look directly at sanctuary staff. Though they can’t be entirely certain, the staff also suspects that her vision has improved. But her headaches appear to be gone, she’s gained weight, and she’s now more sociable with other bears. Image: Matt Hunt via National Geographic.